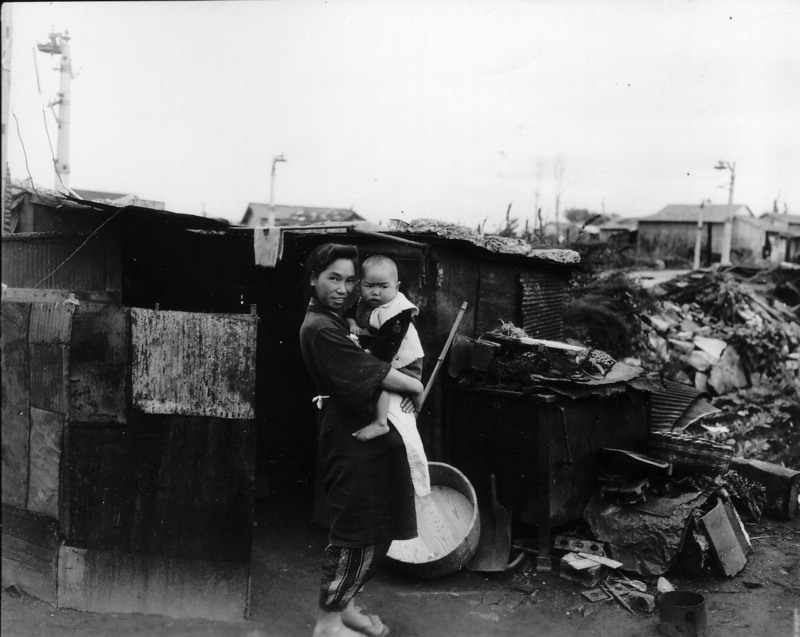 A mother holding her child in Ebisu, a part of Tokyo, and in front of her corrugated tin hut. 1946. National Archives. Indeed, the difficult struggle for food in enough quantities and quality continued. Black markets for food flourished, particularly in larger cities. Housing in the cities, however, was extremely tough. As an example, after many cities were bombed out, millions flocked to Kyoto. MacArthur and other Allied military leaders omitted Kyoto as a target for its ancient cultural richness. Many Japanese had heard of that by war’s end and trekked to Kyoto in hopes of finding a roof over their heads. Unfortunately, all living spaces were occupied. No rooms were available, even at a huge premium. The trees bear the scars of the firebombing. Tokyo Station is in the background being rebuilt with the aid of the US military. Notice the “jinrikisha” lined up in front; they were the equivalent of taxis today and were pulled or pedaled by Japanese men to make a living. Cars will not be available for about ten more years. Taken by my father in March 1948 while serving in the US 8th Army under General Eichelberger. Soon after the bomb was dropped, the hostilities finally ended. However, food and essential goods continued to be largely absent. Amazingly, my cousins who went through that hell choose to reflect on these post-war years positively. That is, reflecting on it as a miserable time will but cause a wound to fester. They had seen enough of festering wounds. But let us step back a year in Aunt Michie’s life. 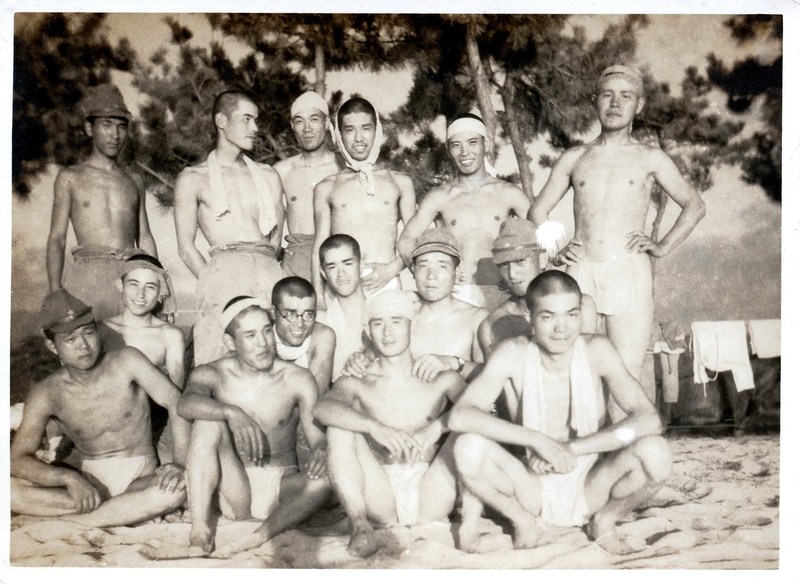 Uncle Suetaro is pictured at the bottom left with his Army buddies. You can see how lean they are due to insufficient nutrition. August 11. 1943. One month before the surrender, Grandmother Kono was informed by the remnants of the Japanese military that her son Suetaro was killed on Leyte fighting as an Imperial Japanese soldier. The date of death was recorded as July 15, 1945. The Emperor capitulated just one month later. Of course, we have no record of that communication nor when Grandmother Kono was actually told, but the bomb was dropped just around this time, we believe. 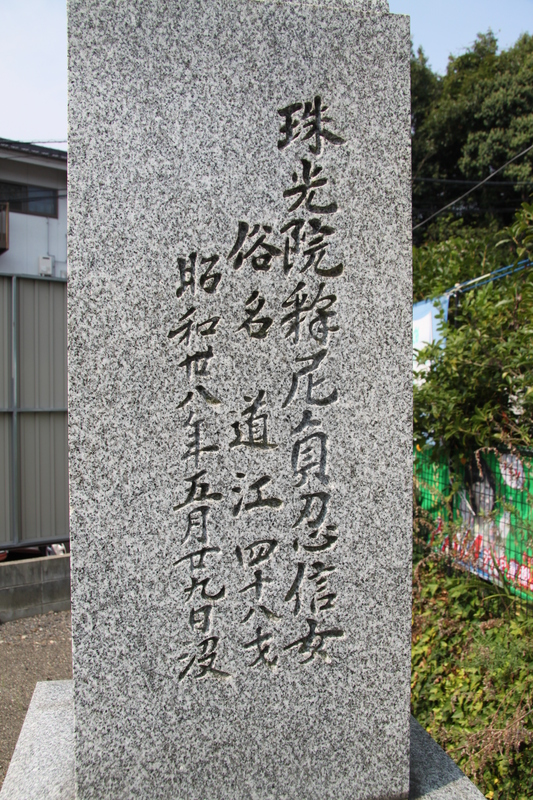 A little more than a year earlier, around March 3, 1944, Suetaro walked to Tomo and Masako’s school. He wrote a farewell note on a chalkboard at Masako’s elementary school to say good bye as he was off to war. 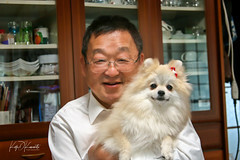 Masako remembers he had written to be a good girl and that he was sorry he couldn’t say good bye in person. The family took their last family picture with Suetaro (Part 2); he was flanked by his older sister Michie and Mikizo. 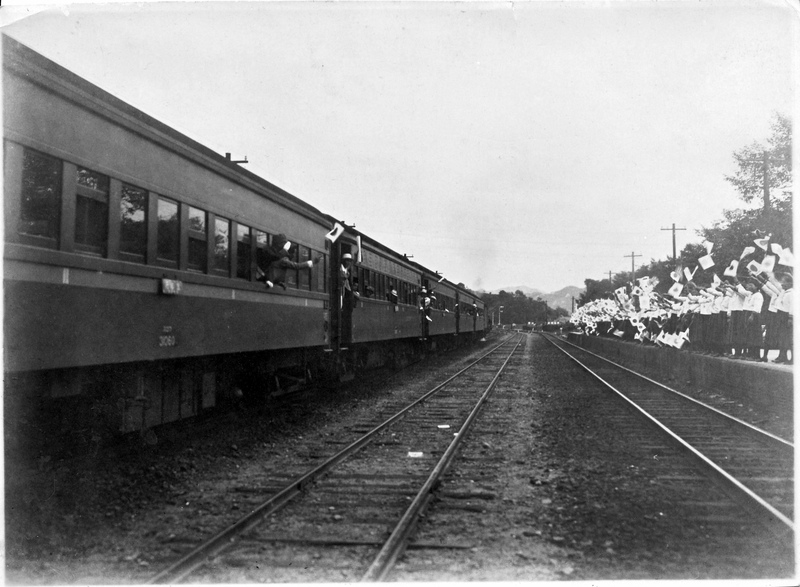 We believe the next day, Aunt Michie went to the train depot to say good bye to Suetaro. She was very fond of him and “his American citizenship”. Everyone loved the fun Suetaro and she apparently talked of him often after his death. But at that farewell, deep down, she knew it would be the last time she would see him. I wonder how she felt watching the train disappear. This photo was in Grandmother Kono’s photo album. Flag waving school girls stand on the right. After talking about it with Kiyoshi, we believe this was the send-off Aunt Michie went to – to see her brother Suetaro go off to war and certain death. 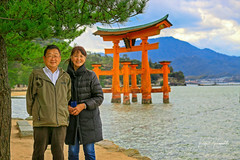 Kiyoshi indicates that a professional photographer took these types of photos at the train station and that the pictures would be offered for sale. 1943. Soldiers rarely came back. Per tradition, he had left Grandma Kono some of his nail clippings and some of his hair. That is what is in the family crypt. For hundreds of thousands, entire bodies would never be found. This was true for America, England, Australia, Russia or Germany. But at least part of him remains there in Hiroshima. The cousins tell me Aunt Michie grieved for days after his departure… and that she was torn apart when she learned of his death. The bomb would fall just days later. According to the family, even shortly after the bedlam caused by the bomb, Aunt Michie continued to care for her stricken mother by walking to her house five miles away when she could. My dad said the road was “pretty” level but that since it is Japan, there were hills along the way, especially near Ishiuchi, a small village. Taken by my father in April 1948 in front of the Hiroshima family home. Holding the baby Kiyoshi, who was born in the home, is Aunt Michie then clockwise – Sadako (who savored the white rice), Masataka, Namie (who pulled maggots out with chopsticks), Masako (who was thrown across her classroom by the shockwave, and Grandmother Kono (who did shaves at her Seattle barbershop). In December 1947, Aunt Michie started to have contractions while walking over such a hill. She was able to make it to Grandmother Kono’s house where she gave birth to Kiyoshi, right then and there. No, no doctor…no nurse… and Grandmother Kono could not help due to her stroke. It is said she was very happy that the birth took place at her childhood home. She grew up there along with her American siblings. She had felt safe. My cousins believe their mother, Aunt Michie, gave all of herself for her children and her family. In spite of malnourishment, she toiled in her farm’s fields, cared for Grandmother Kono, gave her all in the bomb’s aftermath, set the example for her children. She put everyone before her. But soon after giving birth to Kiyoshi, she developed kidney problems. They tell me that medical care then was still pretty non-existent so she had no choice but to ride it out. However, she pushed herself back into working the farm too soon to care for her children, her own stricken mother and other household duties. That was Aunt Michie. Cousin Kiyoshi remembers massaging his mother’s swollen legs after a day’s work. He also fondly remembers perspiring trying to keep up with Aunt Michie on a hot, humid summer day as they walked up a hill overgrown with thick, green wild grass. 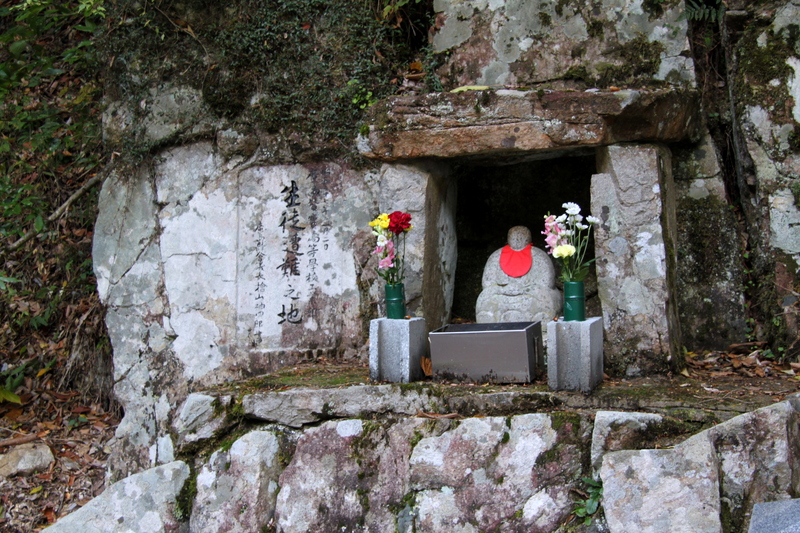 There was a “石じぞう”, or a stone figure representing Buddha, alongside a ridge overlooking a blue Hiroshima Bay. Kiyoshi will always remember that moment, looking at his mother with perspiration running down her face and the blueness of the bay. In retrospect, they feel that if Michie had taken some time to rest and more often that she may have regained her health. On May 29, 1963, she was laying in the same farmhouse in which she nursed the 23 injured people that fateful day. Her kidneys were giving out. She opened her eyes one last time and looked lovingly at each of her children who were gathered about her then closed them. Thirty years after her father gave away her hand in marriage at 19, after 30 years of a life heaped with physical and emotional demands one after another, world changing events and family tragedies… After enduring the pain of survival, Aunt Michie left this world. She was but 48. In September 2012, I visited Aunt Michie for the first time. Masako is flanked by her daughter Izumi and my son Takeshi. Similar to the hot summer morning when she was knocked down by the shockwave, it was hot and humid that day. Now, I feel it was appropriate. Aunt Michie conquered all and gave her life to others so they could get to tomorrow… and she did that with dignity and unconditional love for her children. An epilogue will follow for Part 7…. I remember the scenes shown by some of these photos of Tokyo right after the war ended. As a little boy, I even “foraged” through the burned out houses for anything edible. Sometimes I could find half burned rice in a place where a kitchen must have once located. Strangely I reminisce what I went through those days. But, of course, I never want to go through it again. Koji I am honored to be able to read about your Aunt Michie. ..and I am honored you would take the time to read the blog, Chatter Master. Thank you. And look forward to more. Aunt Michie certainly sacrificed her health for her family but so many had their lives to thank her for. Beautiful testament to a determined woman. I am sure her six children (and my six cousins) would wholeheartedly agree with you… Thank you and my apologies for this belated reply. You have an amazing account of your family history and the dramatic events that were occurring at the time. Such treasures in those photos and memories!! You are very lucky, Koji. …and as you are, gpcox! Thank you for your kind comments once again. Koji – you deserve more! Oh, a tear falls as I read this. What a strong, beautiful person Aunt Michie was, and I can feel the pain as Suetaro left for certain death. How poignant he left nail and hair clippings for his family to have something to bury. 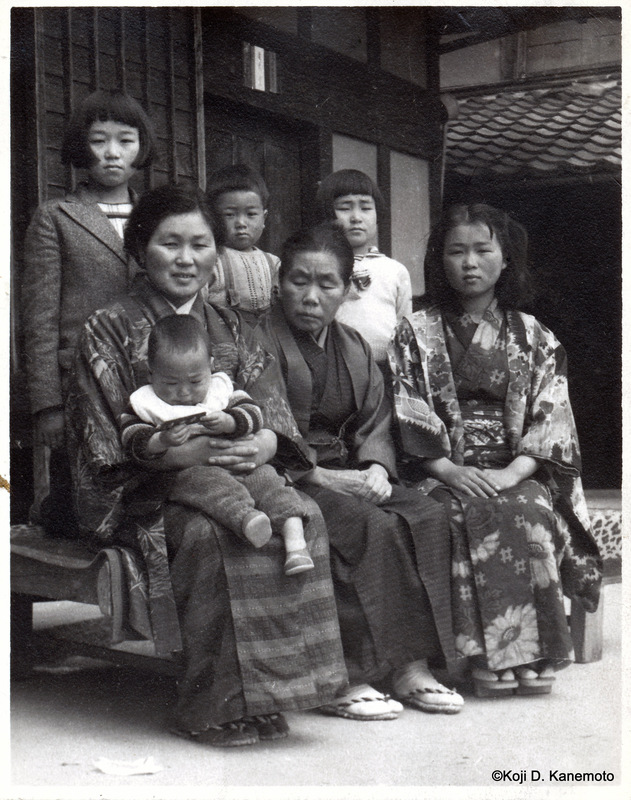 I know many wartime stories of Japan, but you are teaching me so much more, and these old family photos are like gold! Again I thank you for sharing with us. Thank you so much for stopping by and taking the time to read my (long) stories… I need to tell you some day about the Kamikaze Memorial Hall on Edajima. That will break open your eye plumbing for sure…and it has a lot to do with nail clippings and locks of hair. It did for me and my Aunt Eiko in 1999. My regards to the memory of your Aunt. Thank you so very, very much… and my apologies for a tardy reply. I wasn’t prepared to learn that your Aunt Michie died at such a young age. She was so extremely strong in her life as you described her, that I didn’t expect to learn that she lost her health. She was so extremely resilient under the most horrible of circumstances. 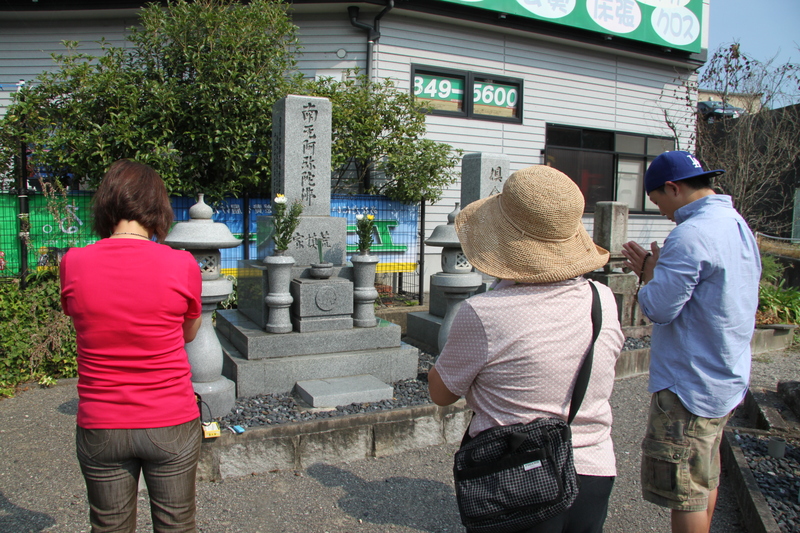 What a privilege it must have been to have return to Japan to pay respects. I’m so touched by this series of posts you’ve shared, Koji. Debra, your kind words are always appreciated. I certainly believe in DNA and two of my aunts (Michie and her youngest sister Mieko) both died from kidney failure. I was still learning about Aunt Michie when I visited her crypt; I wish I knew more then. I love looking at old black and white pictures. That’s so sad and so young–48? Yes… Her youngest sister (as well as my dad’s) also died from kidney problems at the young age of 15. Something must run in our family but in Michie’s case, it was pretty much being worked to death, in a way. I hope you are warming up where you are; it was 96F here in SoCal today. She definitely worked herself into an early passing. But, she did more in those 48 years, than most do who live into their 80’s or 90’s. I think you’re right, sir… and she certainly would not have held her hand out like so many do today. I have very much enjoyed your recounting of your family’s history through these accounts and photos hard won. I appreciate you doing this, for this kind of history (indepth personal look) needs to be done before it’s all gone. Excellent job, Sir Koji. Excellent job indeed, and an honorable achievement for your ancestors to have their stories told across these pages. I hope you will look into publishing on demand style printing of your tale of tales for future generations. Excellent work, gentlemen. Vous êtes une femme très compatissant. You have indeed traveled the world, Melanie. Thank you once again.